Daily snapshots of a ninth grade physics teachers classroom. What to do with tangent lines! 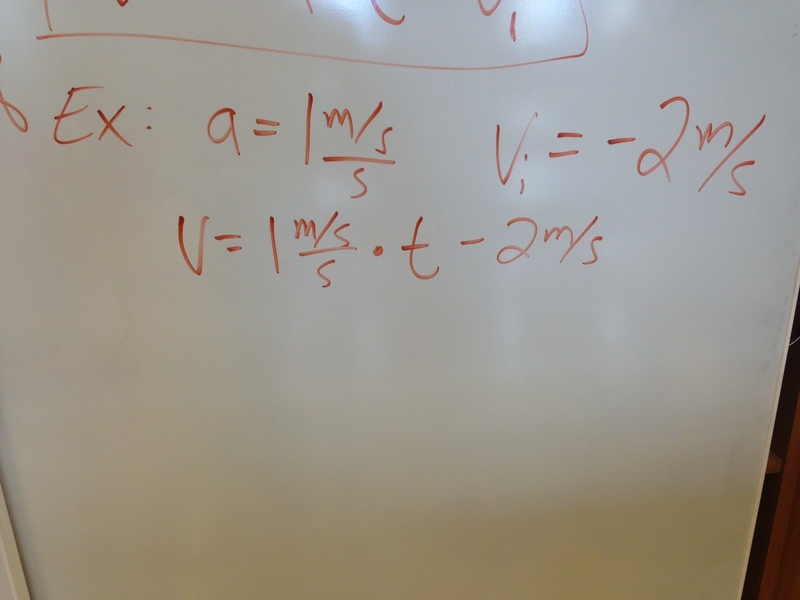 So, after my last post about feeling frustrated that students were missing the exciting transition into defining acceleration, we finally got over the hump! We end up with tangent lines that suggest a rather conspicuous pattern: for each additional second, the velocity increases 10cm/s faster. We included this specific example in the “Consensus Notebook” for CAPM 5, the simplest algebraic representation for accelerated motion. 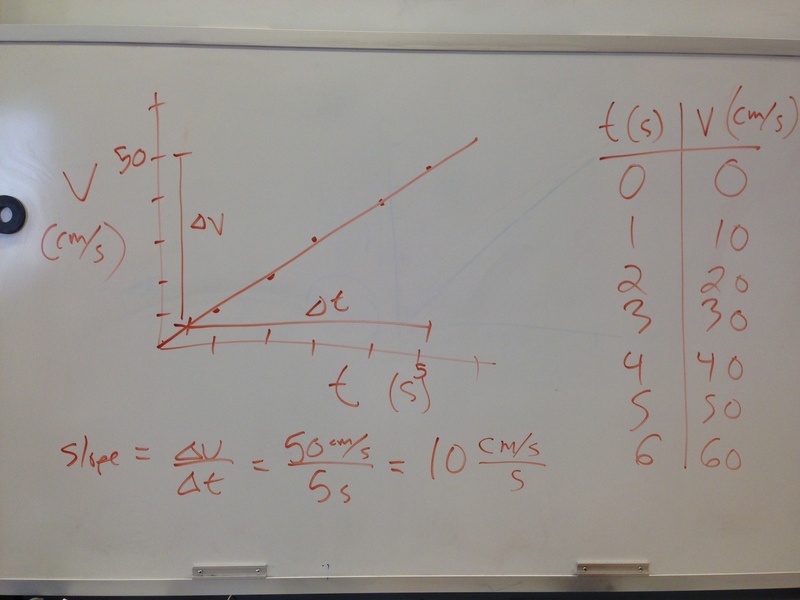 Students wanted to see an example where the initial velocity was negative, so we made up some values. At this point, only a few of them realize what that graph above is actually describing, but I think that’s okay. 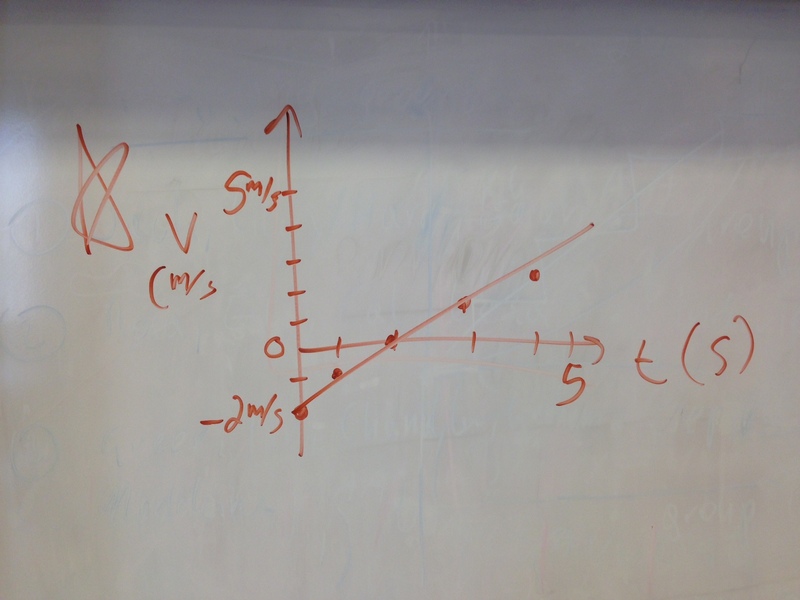 Through a motion detector “paradigm lab” they’ve had a few experiences with constant slopes that go through v=0m/s, and we’ll have more time to solidify this for students before we leave this idea. I’m hoping that this is one of the powerful things about the combined CAPM and BFPM units. 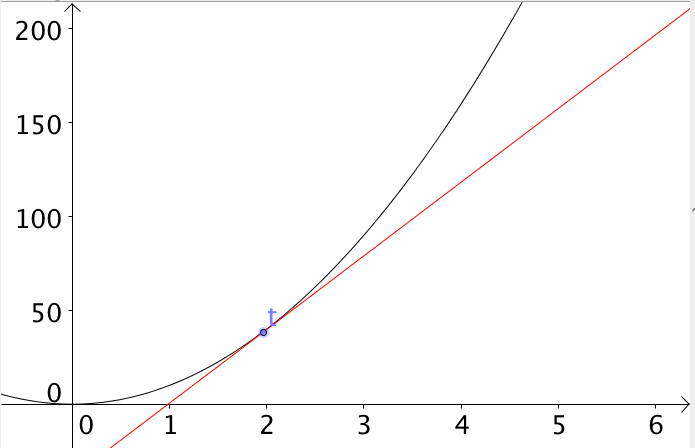 The force diagram can support the idea that the v-t graph shows constant slope through a moment when the object is at rest, and vice versa. Haven’t posted in a while, but things have been going really well in class! We’re transitioning to a combined UFPM and CAPM unit that I’ve assembled. By the way, the combined CAPM and UFPM unit is centered around a big “analyzing complex motion” project”. Students have chosen situations that they think are cool and somewhat complicated – running up the stairs with a backpack, sliding down a water slide, shooting a free throw. The only restriction was that there had to be motion changing at some point in the situation. All our CAPM and UFPM lab and practice work will be occurring simultaneous to this project, so students will be constantly thinking about how the tools we’re developing connect back to the situation that they’re studying in detail. Anyway, more about this later!